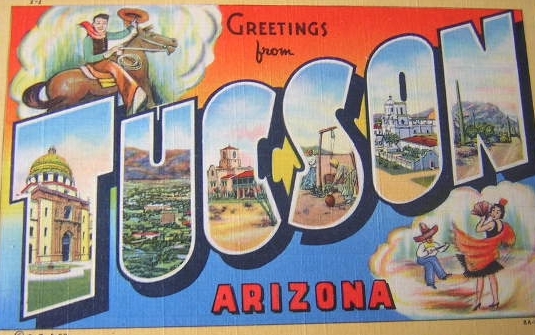 Tucson Days is your starting place to find websites that bring back memories of days gone by in the Old Pueblo. Start here for a trip to Tucson's past. You'll probably enjoy this site if you remember The Midway Drive-In theater on Speedway. And, the Hudson Gas Station in front of it where you could always count on getting a gallon of regular gas for 29.9 or Ethyl for 32.9. Or, the really popular gas stations, Blakely's with that Rocket neon sign and those unique Blakely Cactus Glasses that you got with every fill-up...and so many drawing coupons...you didn't know what you won but the car was full of 'em. Fast food in the days before McDonald's meant Johnie's, the Arctic Circle Drive In, or Lucky Wishbone. Great every day food meant The Arroyo and a slice of one of Margaret's delicious pies. Mexican food could be had at Casa Molina. And, that was right next to Ernie Molina's 76 Station on Wilmot. He'd always come and pull you out of a wash with his Jeep if you got a little crazy during the monsoons. For a special occasion it was Paulos Restaurant, or maybe the Redwood Inn. If you wanted entertainment with it you couldn't beat the Saddle and Sirloin. If you were there in February it was llikely the main act was Tito Guizar. Or, for more shows, and there weren't many, you might catch Morey Amsterdam at The Sky Room on the top of the Arizona Land Title Building. Of course we can't forget the Pago Pago, Ye Olde Lantern, and the Cliff House, too. And, how about that new exotic foreign food from Italy, pizza pie? Tucson had it's share of those restaurants, too, including Sweeney's Yankee Doodle Pizza, Angie's on Speedway, La Cucina, or Rio Rita. Who'd you listen to on the radio? In the mid-50's it was Tucson's first black deejay Sterling Yale at KCNA, 580, or Lucky Lager Dance Time on KVOA, 1290. Later, all the teen listeners glommed on KTKT, Color Channel 99 with hot jocks Frank Kalil and Jerry Stowe. FM radio? There was KTKT-FM, 99.5 playing the classics, but nobody had an FM radio. How about a movie...let's see A Summer Place at the Paramount, or On The Beach at the Fox Theater downtown. For a drive-in, it was hard to beat the Cactus for first run flicks like The Alamo or The Nun's Story. If you were down on your luck you went to see the double feature Hell's Angels on Wheels and Sorority Girl at the Apache Drive-In for just a buck a carload. Christmas meant going downtown to shop at Steinfeld's, Jacome's, or Levy's. But, there were other specialty stores around that gave you good service like NuArt Photo, Crescent Jewelers, Dave Bloom and Sons menswear, or Mars-Hall Music. Tucson was quite a place...and, you know, it still is! PUEBLO HIGH SCHOOL 50 YEARS ANNIV. Columns of Ernesto Portillo, Jr.
MORE LINKS ADDED ALL THE TIME. COME BACK OFTEN!